This totally falls into the “why the heck didn’t I think of it” category. And yes, I know it has been all over fashion blogs and mags here and abroad but I love it and cannot resist. If, like me, you’re unlikely to have a spare $20,000 anytime soon to invest in a covetable Hermès handbag, then meet the Together bag created by LA-based accessories label Thursday Friday. 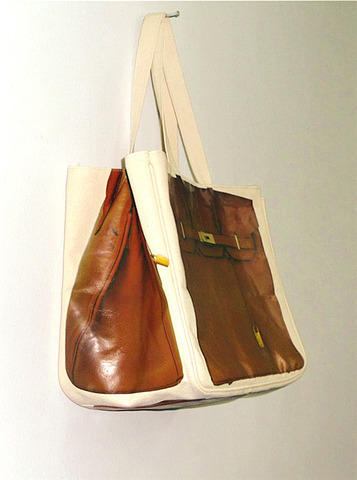 These canvas shoppers are fully lined with an interior pocket for phone and keys; what sets them apart from all the other canvas carryalls being schlepped by gym rats, diaper-toting mamas, greenmarket goers and the environmentally conscious alike is the pop-arty Hermès inspired bag print on all five exterior sides. They’re cheeky, good-looking and practical. Trouble is, just like the iconic Birkin bag they’re “modeled” on, the Together bags sold out within weeks of their launch last year and are now back ordered. 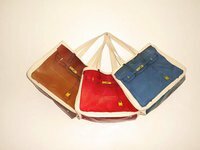 The bags, a sort of anti-status, status symbol and sturdy enough to carry in rain, sun or snow, come in red, blue or camel and with a very manageable $35 price tag. To order, click here.